ecosystem. The demand for rail travel is evident: setup the complete timetable for your central station and deploy all local and national bus, tram and taxi connections. Ride the rails and operate your ultimate grand central empire! Keep your station clean of debris, secure all areas by police officers and never ran a train off the track by employing system engineers. Hire your staff for a more reliable operation. A cleaner station makes passengers happy that increases income. As time flies by your terminal hub starts to expand. Set up restaurants, bars and cafés and allow them to grow and bloom into successful businesses. Open up new building wings and connect all areas with corridors so passengers can easily access all spaces. Train Station Simulator will be shipping with over 25 uniquely designed game modes ready to be played not only for days but weeks and months. The game includes "Campaign", "Ready", "Mission", "Survival" and "Endless" play modes. Train Station Simulator Available from Steam TODAY! 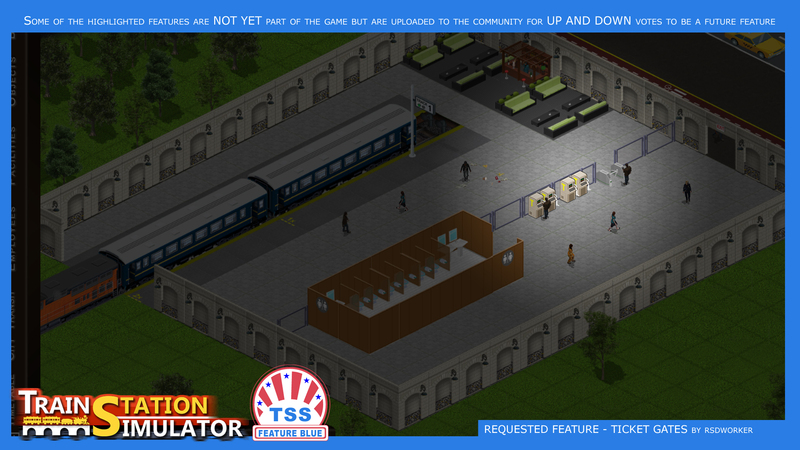 Get Train Station Simulator now! Our great community is started to build and many of our fans started to share their ideas. The community involvement is a key part of the development of Train Station Simulator further. Today we are happy to announce and introduce you the "TSS Feature Blue" . Everyone can join this community - communication club by sharing their thoughts here on the community page. How can you join the TSS Feature Blue? 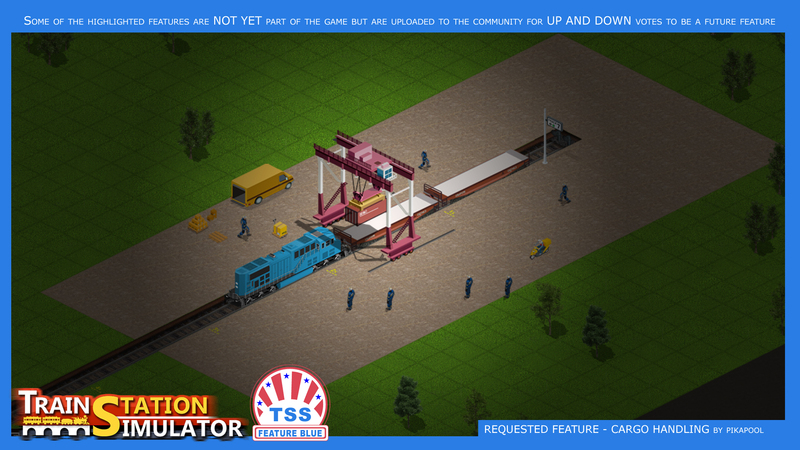 Everyone is in the club who takes active part on the community page of Train Station Simulator on Indiedb.com by suggesting new ideas and helping other members if they have questions. Most important rule is to be nice to the others and respect everyone's requests. Being positive and adding supportive feedback is an extra point. Every week or so we plan to select a great idea from our fans and commenters and we will create a "TSS Feature Blue" image. All members can start up and down vote the image. Each "TSS Feature Blue" image will be available to vote. The most popular features will than be considered to be an upcoming feature in the game. Please consider that these features on these images are NOT YET part of Train Station Simulator and may never be. On the one hand, we would like to create all the features you guys dream. On the other hand, our resources are limited too but we are here for discussion and open for all your suggestions. The selection of next weeks "TSS Feature Blue" will be absolutely random but the more active community members will likely have a bigger chance that we see their ideas. All ideas can be submitted to the Indiedb.com community page. We will open some discussion very soon. This is an absolutely new and innovative plan so we really need the community's help to build this system and maintaining it. Where can I vote to these features / images? All TSS Feature Blue images will be uploaded as a new image in blue frames by the dev team. The first three images will appear shortly to the Indiedb community page. Let's celebrate together on this happy day and enjoy the game! We wish you a happy ride on the rails! Train Station Simulator - Coming Tomorrow! Hello! The game is coming to Steam on 14th December 2017! !